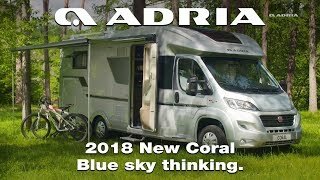 This model has a 2.3l 150bhp automatic engine with Adria motorhome pack and Metallic paint, & motorhome Pack 2 (cab air con, passenger airbag, cruise control, front fog lights, leather steering wheel & gear knob, ESP & Traction + with hill decent) and alloy wheels. The new Plus models on the Fiat Ducato, New Sky Lounge and Sky Roof.With additional equipment compared to the Axess models, the Plus models come with new interior design and Truma. Externally the Coral has a ‘Slim-fit’ profile, with a new rear wall design with horizontal lights, a new wider entrance door and large external garage space for storage. The Coral sets the new benchmark for low profile motorhomes, with optimised space, contemporary interior designs and layouts. From the large lounge dinette, to the CleVer V-shaped kitchen with oven and grill, spacious ‘hotel style’ washroom and comfortable bedrooms, the Coral offers loft-style living in a slim-fit exterior design. Contemporary interior design with choice of furniture and textiles.